Since releasing Phase I of its four phase Naples Square development in downtown Naples for reservation five years ago, The Ronto Group has completed construction of Phases I and II and is on schedule to complete Phase III next spring. More than 200 of the 300 residences have been sold. Homebuyers have been captivated by Naples Square’s location, walkable/bikeable lifestyle, amenities that include club rooms, fitness centers, and landscaped courtyard amenity decks with swimming pools and grills, and open-concept floor plans. Buoyed by the market response to Naples Square, Ronto took its vision of a downtown district where people are within walking or biking distance of enjoying downtown’s attractions a step farther with the introduction of Eleven Eleven Central last January. Situated on Central Avenue between 10th Street and Goodlette-Frank Road one block north of Naples Square, Eleven Eleven Central is adjacent to the Design District, just five blocks from Fifth Avenue South, and access to Baker Park and the Gordon River Pedestrian Bridge and Boardwalk leading to the Gordon River Greenway. Naples’ beach is just three-quarters of a mile from the community via the sidewalks and bike lanes on Central Avenue or a short ride on the planned community beach shuttle. The three-phase project will include 210 residences at completion, 62 of which are included in Phase I. Ronto anticipates beginning construction within the next 30 to 60 days. Like Naples Square, the response to the Eleven Eleven Central offering was practically instantaneous. In just 11 months, Ronto has processed record reservations and contract conversions for every type of floor plan and view. Buyers have been attracted by Eleven Eleven Central’s location, the community’s resort-style amenities that include a courtyard amenity deck and pool, fitness center, club room, and an arcade/ game room, and five Phase I floor plans originally priced starting in the $500’s. Two of the floor plans have sold out and Phase I is more than 50 percent sold. 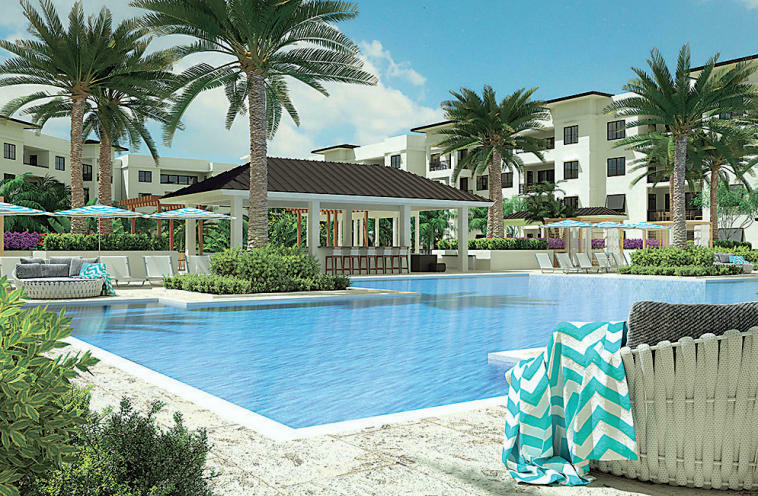 Pre-construction pricing on the remaining unsold Phase I residences starts at $725,000. The similarly sized residences at Eleven Eleven Central and Naples Square reflect Ronto’s ability to combine space, style, and imagination to create an environment that is comfortable and maintains a connection with the outdoors. Base priced at $820,000, the two-bedroom plus den, two-and-a-half bath Collins floor plan at Eleven Eleven Central includes 1,947 total square feet of living space with 1,757 square feet under air. The living area opens to a covered balcony and includes a great room, dining area, and island kitchen. The owner’s suite features two walk-in closets, a bath with his and her vanities, and a bedroom with a sitting area. The Phase III Biltmore plan at Naples Square offers 1,940 square feet of living space, including a 242-square-foot balcony. Base priced at $927,500, the two bedroom plus den great room plan includes a counter-height island kitchen with a stainless-steel sink, dishwasher and a food preparation area. The great room, owner’s bedroom, and guest bedroom all open to the balcony. The owner’s suite includes walk-in closets and a bath with a glass-enclosed shower and his and her vanities. Each Biltmore residence overlooks Phase III’s landscaped courtyard. Base priced at $1.055 million, the three-bedroom, three-and-a-half bath Duval plan at Eleven Eleven Central features 2,297 square feet of living space with 2,045 square feet under air. Each guest bedroom includes a private bath and one of the guest bedrooms opens to the covered balcony. The living area features a great room, dining area, and an island kitchen wrapped by perimeter cabinetry and counter surfaces. The great room and dining area open to the covered balcony. Naples Square’s Phase III Chatham two-bedroom plus den, two-and-a-half bath plan is base priced at $985,000 and includes 2,143 square feet of living space with a 260-square-foot balcony. The great room, owner’s bedroom, and guest bedroom open to the balcony. The kitchen features a peninsula counter height bar and food preparation area with a double sink and dishwasher. The owner’s suite includes a bath with a glass enclosed shower and tub and his and her vanities. The Eleven Eleven Central and Naples Square residences will feature luxurious standard finishes or optional finishes that will allow each resident to customize their home. Standard finishes at Eleven Eleven Central include 10- foot ceilings, 8-inch baseboards, polished chrome lever door hardware, porcelain tile flooring, 8-foot two-panel solid core interior doors, 8-foot sliding glass doors and exterior doors, and Whirlpool electric washers and dryers. Standard features in the kitchen showcase working islands, stainless steel undermount sinks, granite or quartz countertops, North American Cabinets, and Whirlpool stainless steel appliances, including a slide-in range with a convection oven and a French door counter depth refrigerator. Standard features in the owner’s bath include under-mount sinks, a 60-by-32- inch tub, framed glass shower doors, 36- inch height vanities, and chrome fixtures. Standard details at Naples Square include porcelain tile flooring in the living areas, kitchens and baths, 8-foot solid core interior doors, 8-foot exterior and sliding glass doors, lever-style door hardware, 8-inch clean-lined baseboards, 7-inch crown molding per plan, ventilated wood shelving in the owner’s bedroom closets, and laundry rooms with a Whirlpool Duet washer and dryer. Phase III’s open kitchens will feature an enhanced appliance package with a gas cooktop and hood and a wall mounted oven and microwave. European frameless construction, full-overlay cabinetry with a variety of door profiles, finish selections and hardware, a stainless steel, under-mount sink with a pull-out spray faucet, and multiple granite and quartz countertop options are included. The master bath features marble-topped vanities with dual sinks, large showers with bench seats and glass enclosures, and soaking tubs with most floor plans.